Welcome to Black Panther History Month. 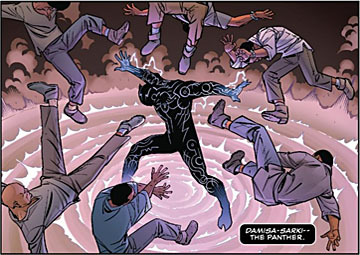 T'Challa wears a glowing suit made with Vibranium technology as the warrior hero, Black Panther. Yes he does, but that wasn't always the case: originally, his costume was just plain cloth, and was constantly getting ripped in the middle of his brutal fights. It wasn't until Christopher Priest's character-redefining "Marvel Knights" run in the '90s that Wakanda's #1 natural resource was integrated into her king's costume. It seems like such a no-brainer, doesn't it? And yet it's only been a feature for less than half of the character's existence. And even then, it was originally just used as armor - it was during Ta-Nehisi Coates' recent run that things got more creative than that. Vibranium absorbs sound - but as you remember from your basic science classes, energy can't be destroyed, so those vibrations have to go somewhere. Wakandan scientists realized this same thing, so while most of the world just thinks of Vibranium as something that absorbs energy, they worked on how to get it back out again. So T'Challa's current suit has technology that allows him to access and channel that stored energy into kinetic power (with a little bit of waste product in the form of photons). 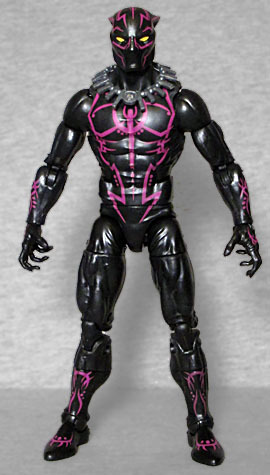 That ability is represented on this figure by the stylized purple lines painted all over its chest, forearms and shins: those aren't a pattern on cloth, they're pure energy. That said, the toy either goes too far, or doesn't go too far enough. If you look at the comic art, he gets absolutely covered in lines; there's almost no solid black left on him. We can understand why Hasbro went this route - between Black Panther and Killmonger in the movie line, and Walmart's other exclusive Black Panther, there are already plenty solid black figures on the shelves - but in for a penny, in for a pound. Paint those arms! Paint those legs! Do it all! And if you really want to be legendary? Paint it all with glow-in-the-dark paint. Panther uses an existing body, but he gets a new head. Well, technically, two: one with purple stripes, one without. The figure is based on the art of the underrated Brian Stelfreeze, and one of the changes he made to the character design was to have the ears on the mask point backwards, like a cat when it's angry; a small tweak, but very smart! The figure has two sets of hands: one pair with the fingers open, the other closed into fists. The fists are used in conjunction with the fiery energy effects, but they still get the purple stripes painted on the backs. He's also wearing a new necklace, which comes from the same story as the rest of the design. To be really accurate, Hasbro should also have given him new feet: he doesn't wear normal boots, but rather ones with separate toes. The other Walmart-exclusive Black Panther wasn't really a necessity - it's this figure with an old cape and Kraven's spear and necklace - but this one is something new. It's a costume no one's made before, not even the notoriously speedy Marvel Minimates, and the cool head alone is a good selling point for it. The purple is... understandable, if nothing else. Too much and it would have been weird, too little and it would have been plain... there was a fine line to walk here, and you can't fault Hasbro for the path they took.